Of course, one of the neat things about moving, once you’ve made the decision to do it and gotten over the shock of everything being different and new is that everything is different and new. It’s a whole fresh start with fresh surroundings. And this doesn’t just apply to the house and the neighbourhood. It also applies to the natural landscape. Unless you only moved two doors down the street, chances are you’ll have moved into a slightly different plant and animal community than you left behind. It may be very slight – perhaps in your new place you notice a catbird nesting in the shrub in your backyard, where you never saw a catbird in your yard at your old place. Or it may be dramatic – you’ve moved from pastoral countryside and rolling hills into rocky Shield country and thick forest cover. In the case of the latter, the whole ecosystem community can change. The move for Dan and I was fairly dramatic – even if you skip over the urban Toronto stage, much of the surrounding GTA countryside is fairly pastoral, even the areas that are relatively wooded. Where we live now a pasture is uncommon, and the huge expanses of forest, the lakes, and the landscape full of ridges are all features that weren’t found where we grew up. For my parents the move is less of a change. If anything, they’re going to a more agriculturally-dominant area than what they’re leaving, since the Niagara Escarpment is not very suitable for farming so much of it remains forested. The landscape here is a lot flatter than that surrounding their old home. The differences manifest themselves in other ways. For example, there are ravens here, and they’re fairly common, but the species doesn’t make it as far south as Toronto. And there is this stuff. And it is everywhere. I don’t recall seeing it before, although that doesn’t mean it doesn’t occur in other regions I’ve frequented, simply that if it does then I’ve overlooked it. It certainly caught my eye here, though, because it’s so abundant, and it seems to favour the open areas along the trails, forming the predominant ground cover in some areas. I had no idea what it was, so I had to look it up upon my return to the house. Naturally most of the books are still packed up and haven’t been moved yet, so I had to rely on vague search terms entered into Google. It was surprisingly easier than I was expecting to find an answer, however, and including that it seemed to favour “moist ground” into the search string helped. 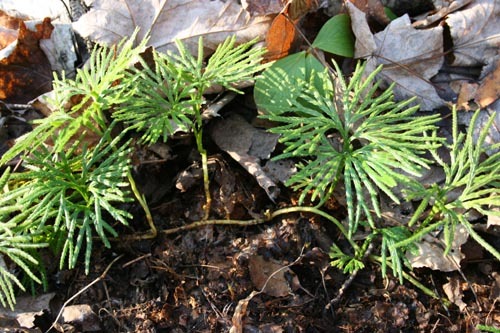 It is Diphasiastrum digitatum, variously known by the common names Fan Clubmoss, Trailing Ground-Pine, Southern Ground-Cedar, Running Cedar, Southern Running-Pine, and others. By clearing the leaves away from the base of the plants you can see the reason for some of the names. What looks like a colony of little plants is actually a single plant putting up vertical branches from a runner. When encountered in the forest they are often growing in lines, a result of growing along a runner (as below). 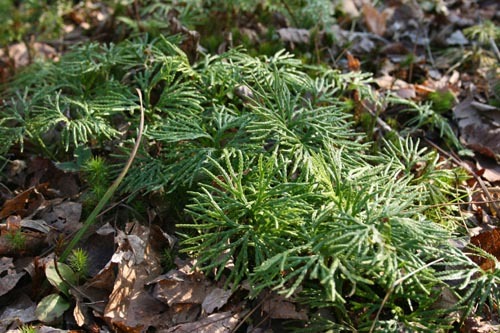 However, only the name Fan Clubmoss is actually accurate otherwise. 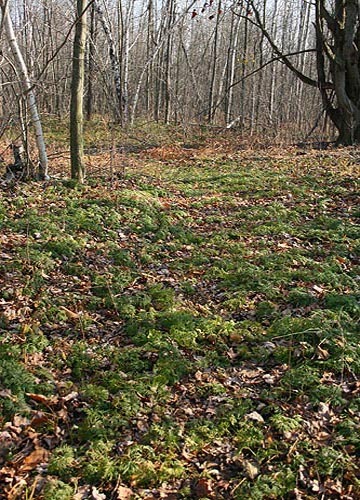 The plant is a member of the family Lycopodiaceae, the clubmosses. Clubmosses are not pines, however, nor cedars, nor in fact even closely related to trees at all. If they have a close relative it might be considered ferns, and sometimes they are referred to as “fern-allies”, but even this connection is relatively distant. Clubmosses are an ancient group of plants, going back 420 million years ago to prehistoric times where some species could grow to the size of palm trees, and in a similar manner (losing the lower “leaves” from the trunk as they grow, leaving a tuft at the top). These days none of the remaining species grow that large. The modern world’s diversity of clubmosses is pretty sparse compared to what existed millions of years ago. The majority of known genera in this family are actually extinct. The plants are evergreen, like their namesake trees, and do actually resemble cedar a bit in the scaly appearance and waxy texture of their leaves. Unlike most plants, they don’t reproduce through seeds, but rather through spores, like ferns or fungi. 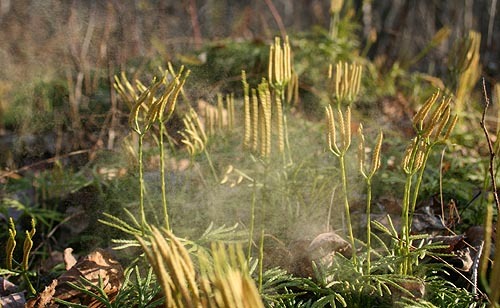 They send up clubbed shoots (which give the group their common name), which, when brushed or blown in the wind, release puffs of spores into the air for the wind to carry to a new location. In centuries past the spores were used for a lot of things. Violin makers used them to fill in pores in the wood of their instruments. Theatres used them for pyrotechnics, because they burn quickly and with little heat, so were considered safe by the standards of the time. They’ve been used as fingerprint powders, as a stabilizer in ice cream, and suspended in air during physics experiments to visualize soundwaves. 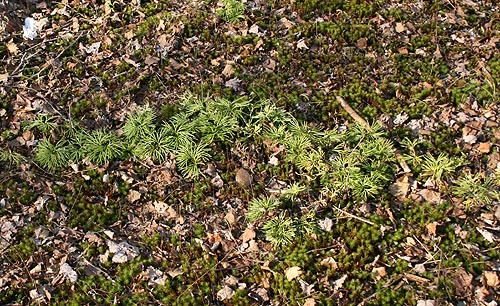 A species of Asian clubmoss is currently under investigation as a possible treatment for Alzheimer’s. Pretty neat for a simple ground-growing forest plant. I’m up at Dundalk again, and am surprised at how many birds I don’t recognize without binoculars. Your entry is timely! Now that’s a thought, Lavenderbay – I could certainly get on board with that regimen! Very nice article. There is a patch of this out in the woods behind my family home in southeast Pennsylvania.